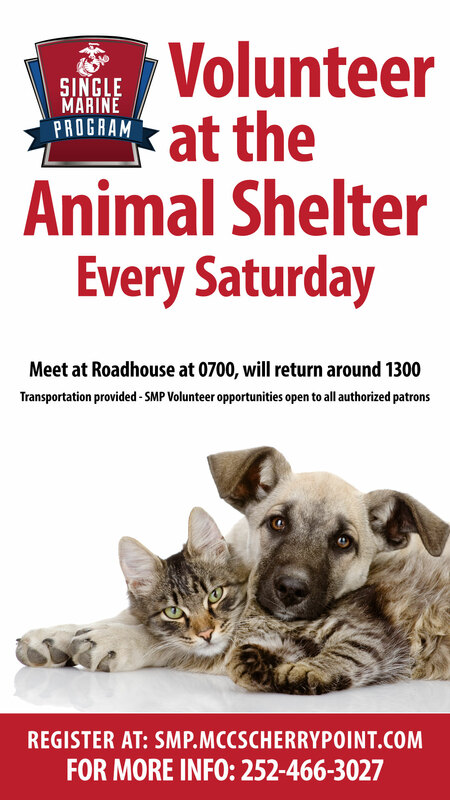 Animal Shelter : Volunteer at the Carteret County Animal Rescue from 0700-1200. Assist with walking the dogs, meeting with potential adopters, special projects, and cleaning. Meet at the Roadhouse at 0700. If you are going POV, please ensure to pick up an SMP POV Volunteer Log at the front desk, so that your LOA’s can be completed. FOR MORE INFORMATION PLEASE CONTACT THE SMP FRONT DESK AT 252-466-3027.